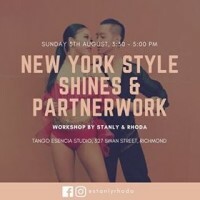 Stanly & Rhoda are super excited to be bringing you monthly pop-up workshops! Each month will have a different theme, and this time, we're doing New York style mambo. ? After our 3-week dance training trip to New York earlier this year, we couldn't wait to inspire you with some of the moves and techniques that we learned. This workshop is designed for intermediate-plus dancers who are up for a challenge. It will be a 1.5-hour salsa on2 class that will cover both shines and partnerwork. ? QUERIES: Message us on Facebook! ?